Hawken is a free-to-play FPS where you pilot various models of giant robot suit and try to shoot other giant robot suits right in the face. It’s often called “Call of Duty with robots” and now that I’ve played it I can see why; Hawken’s sin isn’t that it’s bad, it’s that it’s utterly and unremittingly average and unimaginative in every single way that matters. It’s a stock FPS that criminally reduces its giant robots to window dressing only and barely even tries to distinguish itself from the hundred other multiplayer FPSes out there vying for my attention. I’m going to use Mechwarrior Online as my baseline comparison here since no matter what else can be said about that game I think it really nailed the whole giant robot concept. It’s ‘Mechs had a real sense of momentum, weight and scale, while the ‘Mech weapons felt meaty and powerful and correctly communicated the force of their impact to the player whether they were they shooting the guns or inside the cockpit of the ‘Mech unfortunate enough to be hit by the rounds. Once you’d accelerated your 50-ton Centurion up to top speed you knew you weren’t turning that thing around any time soon, and it balanced the different classes of ‘Mech by situating ‘Mech weapons in places that made it difficult for larger ‘Mechs to target smaller, fast-moving ones. ‘Mechs could get weapons and limbs blown off and still continue functioning at a reduced capacity. In short, when you play Mechwarrior Online you can tell you’re in a giant robot suit because that’s exactly what it feels like and how the game plays. It’s not like a traditional FPS at all. That’s how Mechwarrior Online distinguishes itself from its competition. It’s in the name, for crying out loud. 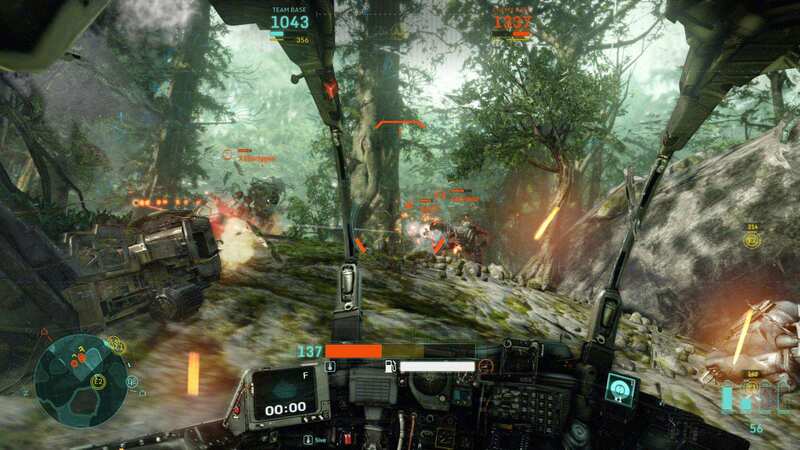 My complaint about Hawken isn’t “It’s not Mechwarrior Online”. Hawken wants to do smaller, more agile robots than the lumbering behemoths of MWO, and that’s fine. 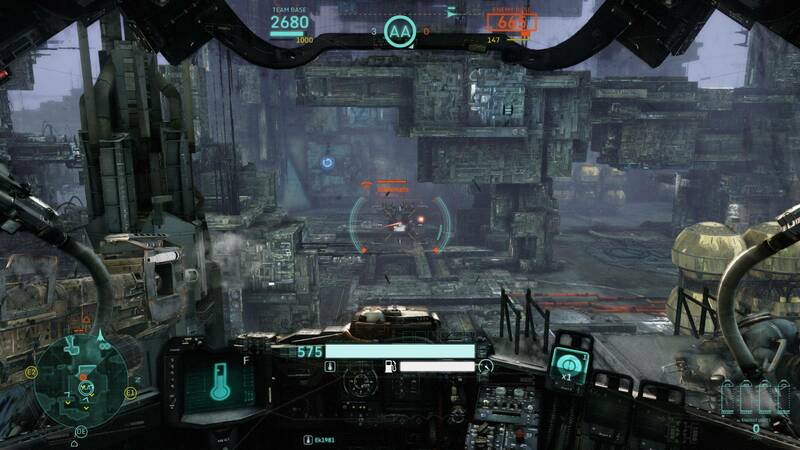 Hawken doesn’t want to overwhelm the player with engine output and ammunition storage and balancing weapon heat, preferring a simpler set of loadouts for its robots that simply allow you to choose from a primary and secondary weapon on each arm (the secondary must be unlocked through either grind or by paying Hawken bucks, naturally) which have unlimited ammo but which overheat when fired too much, and that’s fine too. If Hawken were a comparatively simple take on giant robots but still managed to carve out its own identity in the marketplace, that would be great. I’m all for that. No, my problem with Hawken is that rather than being a simplistic giant robot game, the fact that you’re supposedly piloting a giant robot suit is utterly irrelevant to how the game plays and feels. Hawken’s robots control like any other FPS character; they can run, sprint, strafe, dodge and even have the capability to do instant u-turns. The only concession to your robotitude is that you cannot crouch. Hawken’s robots have a single health bar for the entire robot, and when you get damaged you just run behind a piece of cover and push the “Repair” button and then watch as your robot repairs itself back up to full health – again, just like any other multiplayer FPS, except with an extra button involved. 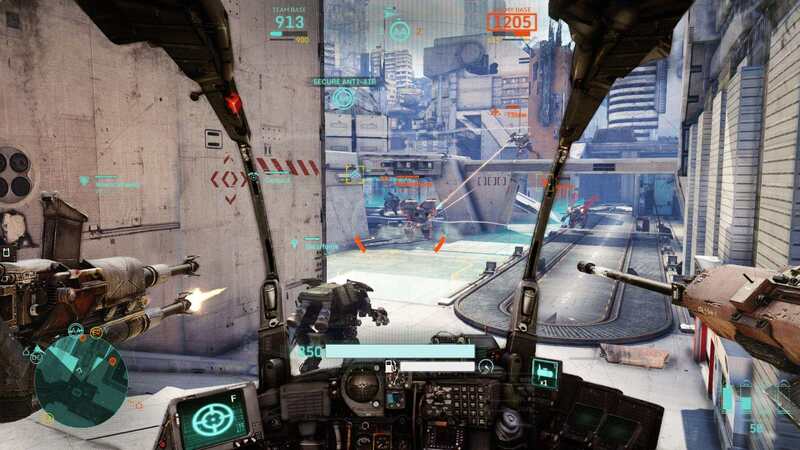 Hawken’s weapons are the stock genre machine guns, shotguns and rocket launchers, with none of the blat-blat lasers and meaty cannon that so characterised MWO. Hawken has utility items that you can stick on your robots tho give them special abilities, but these special abilities are nothing that hasn’t been seen a thousand times before in every other FPS under the sun1: cloaking mode, berserk mode, fire more accurately while moving mode – it’s like they were running down a list of what other FPSes did and picking and choosing what they wanted to include in Hawken, without any thought given to how they could strike out in their own direction. Hawken’s level design is also really weird, with most maps being made up of a collection of identikit geometric shapes that blend into one another and completely fail to give any sense of scale to the environment. Some of them actually reminded me of Mario Kart 64’s Block Fort level in terms of visual design, which is not a comparison I want to be making to a modern game in 2014. In terms of game modes, if you want to play competitive multiplayer there’s just three: deathmatch, point control and Siege, which is a slightly unusual take on King of the Hill where you scrabble up energy to launch a battleship and then sit on top of an AA point while it lays waste to the enemy base/try to get control of the AA point to shoot it down, but which ultimately plays out much the same way since the ancillary trimmings have little impact on the actual mechanics. This isn’t a particularly fair criticism since MWO didn’t do much to innovate here either, but it had its other strengths to fall back on. All Hawken has to complement its run-of-the-mill objectives are its identikit game mechanics, and as it is that’s really not enough. Compounding this dullness is Hawken’s matchmaker, which seems utterly incapable of producing anything resembling fair and balanced teams. There’s six players per side, and while you do respawn in Hawken there doesn’t really seem to be much point when it’s stacked all the experienced players on one team and a bunch of blithering idiots who don’t even understand that you have to stand on the point to win on the other. I think that out of the 12-14 Siege games I’ve played (each lasting twenty minutes or so) exactly two of them had both teams getting the enemy base to below a third of its hit points. The rest were one-sided stomps that aren’t fun to be on either side of. That’s a pretty damning statistic, and one that doesn’t bode well for Hawken’s long-term potential. Does Hawken do anything that I actually like? I’m struggling to think of anything here; the menu music was pretty good but you only hear that in the brief moments you spend trying to customise your robot in between matches. The starter robot is also pretty good despite looking like a washing machine on legs; it has a decent mix of health, power and mobility and can hold its own against the pay-for/grind-to-unlock robots. In fact the range of robots in general seem to be pretty well balanced, with each filling a specific role and no one class being significantly better than the rest. That’s a pretty decent achievement, and one that should be praised; it’s just unfortunate that it’s married to this gameplay experience that’s dull as ditchwater. If I hadn’t gotten a few different robot types to try out as part of the Steam pack I bought I doubt I would have even made it this far into Hawken, it’s so insipidly uninspiring. I’ve heard that Hawken isn’t doing that well financially, and that its Steam release (coupled with a big balance patch that seems to have dumbed everything down into its current state in an attempt to give the game broader appeal) is the last throw of the dice. Maybe it’ll work. Maybe it’ll appeal to people who aren’t me, and it’ll turn out that what the CoD-playing masses really wanted was a similar game skinned with giant robots. Somehow I doubt it, though; the result is a bland, characterless mess that I really wanted to like – if only because I needed a giant robot fix to tide me over until Titanfall – but which in the end couldn’t even sustain my interest for five hours. Yes, it’s free-to-play, but so are all the other, better games I mentioned at the start of the review. When the only investment you have to make into a game is the time spent playing it, and Hawken isn’t even worth that, you know you have a stinker on your hands. I’d avoid it if at all possible. You nailed it. You describe precisely why I uninstalled the game 10 minutes after playing it despite the fact I had been looking forward to it for so long. it felt like I was playing Quake (which should give you some idea of how often I actually pay any sort of MP FPS these days). I would have liked it considerably more if it had had the courage to be Quake with robots. If you’re going to go mobility, go full mobility. And I was looking forward to Hawken too since I do like my giant robots, which is why it’s all the more disappointing that it’s turned out so mediocre. Ah well. 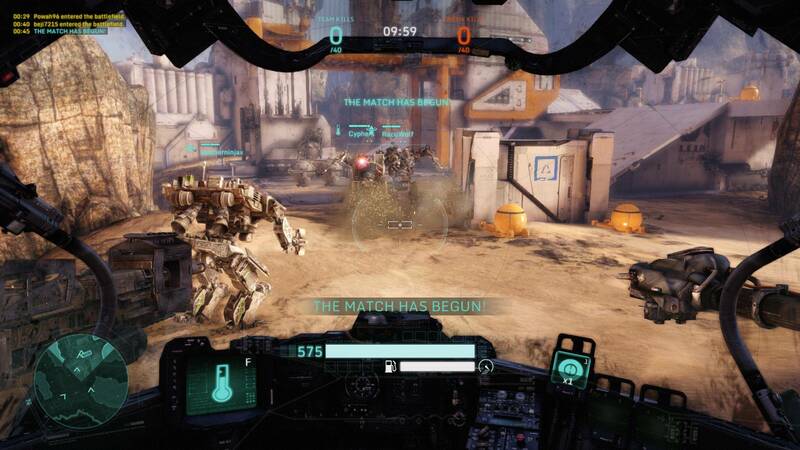 The rumbles from the Titanfall beta are promising; all EA have to do now is not botch the launch. Which, let us be realistic, is actually fairly likely given their recent record. I actually didn’t think I’d like a F2P game until people persuaded me to play War Thunder. You’re right that nothing would put me off playing a game and spending money on it more than the sense that it was begrudging me not feeding it quarters. War Thunder’s an unusual one with a monetisation strategy that targets a small subset of players but which assumes extremely high player retention and engagement amongst those players. In other words it’s playing the long game similar to EVE Online; it doesn’t want to grow a huge userbase, but the players it has will stick around for an extremely long time since the core experience is sufficiently generous so as to be basically evergreen, and thus they have a very high chance of eventually forking over some cash for an aeroplane. Out of all the games I listed above — save possibly Hearthstone — it’s War Thunder that I’d expect to still be alive and kicking five years from now. Thanks for the review. You definately cleared up some of the aspects of Hawken that I was wondering about. I’m not a fan of cookie cutter games at all, especially typical bland rinse & repeat formulaic shooters. And now that you’ve mentioned it, it does look just like a reskinned cod… Good review.